One of the best experiences I had while visiting Pistoia this Summer was all the delicious food and local products that I tasted there. Amongst all those delicacies –about which I will be posting soon on this blog and on the CCT-SeeCity page–, I tried for the first time in my live a turmeric croissant. 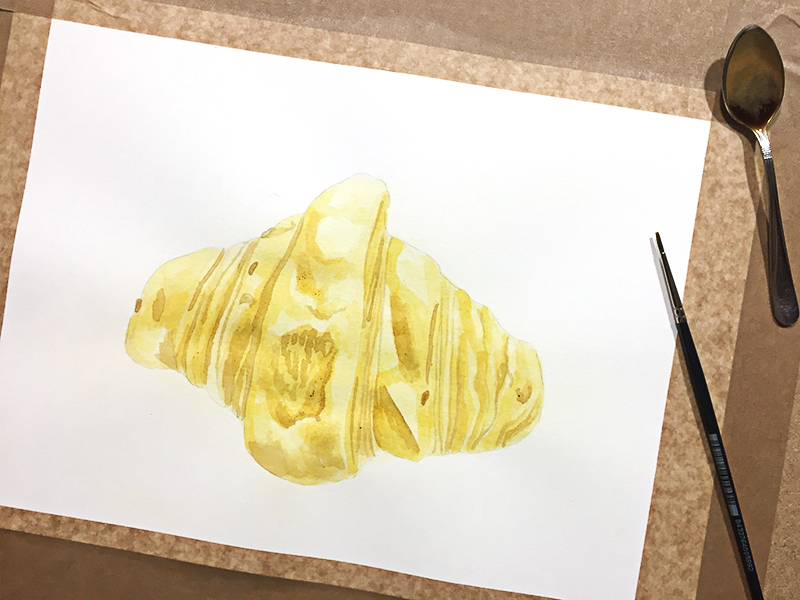 Being a fan of this beautiful yellow ochre powder and practically using it all my meals, I returned home with the idea of also using it as a natural pigment for a painting. A few weeks had gone by since I had the intention and finally last Monday I started to put it into practice. While there are far more developed approaches in terms of making your own natural watercolors, such as using gum arabic or other binders, I choose to just mix the pigments or powders I had in my pantry with water. As I was merely trying to see the effect of turmeric at first, I thought that I could spare using more ingredients. So, initially, I was only going to use turmeric and graphite in the end to give the painting definition. 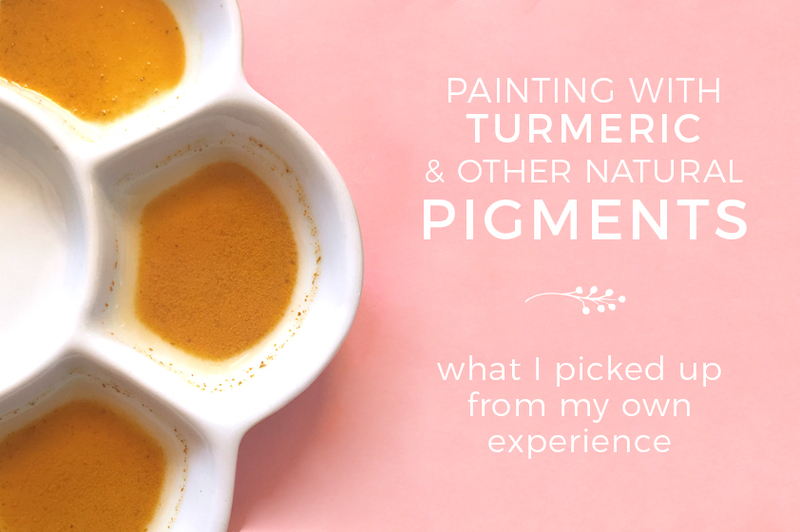 As I started with my first wash of turmeric powder diluted in water –I always go very light and then add more layers–, I noticed immediately what I had anticipated. The color was rich and beautiful right away. 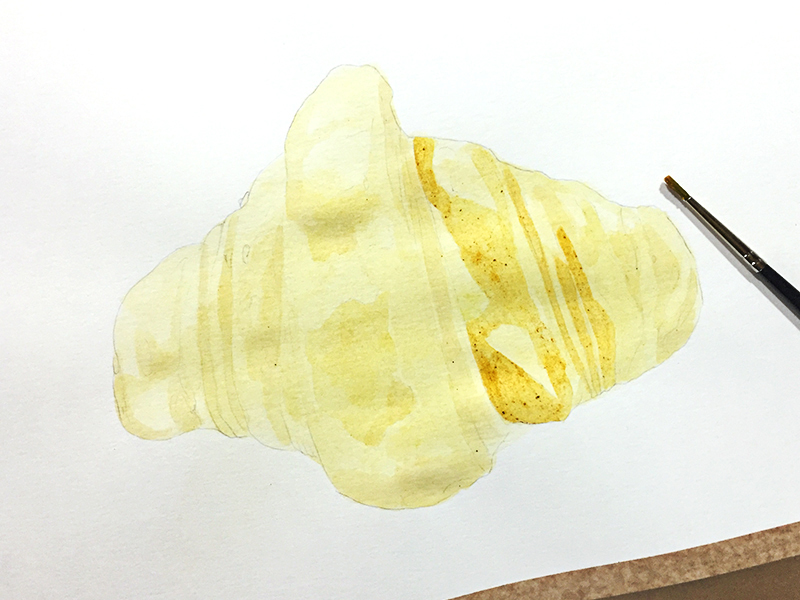 Since I hadn't use a grinding muller or any other tool to refine the mixture, the Canson mixed media paper I used was filled with little turmeric granules which could be easily removed once the paint had dried. I became more and more excited with the "experiment" I was carrying out and I decided that turmeric wasn't enough to cover my curiosity. At that point, I picked also cinnamon powder considering that I needed a darker tone for the illustration. I also thought of grinding star anises but discarded the notion in the end. Display of pigments as I used them with the first washes of paint. While turmeric was very pigmented, I found out that cinnamon was not. I even had cinnamon infusing in water for one day but still the pigmentation was too subtle. I still needed to find that darker brown tint for shadow and dimension. After commenting using natural pigments with other fellow artists online, I immediately picked up on Sandra Strait's explanation of her having used coffee and tea. That was I great idea, I thought! As I had already seen illustrations painted with coffee and I was more certain on how to use it, I chose the latter. Soluble coffee, to be exact. I was indeed effective! Adding more layers of turmeric. Trying out a coffee wash for depth and dimension. As I kept on with the illustration, I was more and more interested in investigating more pigments and building up the tones. My pantry feared the worst as I opened it looking out for inspiration. The next spice I picked was paprika powder or ground red pepper –pimentón as we call it here–, as I figured that a little red undertone would be perfect. Again, the only problem was not refining the mixture with water, as the granules stayed on the paper and brushes. Once they dried, though, they could be easily removed. The paprika powder was also very pigmented and had the effect that I wanted. By mixing the spices, I also got different variations on the color palette of soft yellow earth tones that I was aiming for. Final illustration and color chart for pigment use and combinations. If you are also interested in using natural pigments, I also encourage you to try them out. We don't often think about it but there is an immense world of possibilities, from household ingredients to flowers or even shells! Nature is a really generous provider. As I said on the post, I only tried mixing the ingredients with water and I didn't even refine the mixture but I could have also used a filter to get the infused water of each spice. I really intend on improving this process and trying new shades and palettes in the future. I found there are multiple sites on the matter and offering tips on the process and tools to use like this post on Natural Earth Paint regarding making natural watercolors but I guess there is no better learning than trying. I hope this post was somehow inspiring for you but I am by no means an expert as this was my first attempt at using natural pigments, the ones that I could easily find in my pantry really. I would really love to hear about your own experiences and if you have questions, thoughts or more knowledge on this subject please comment below so that we can learn together. Hello again! This is the place where I will be sharing what inspires me, my process and some of the latest news and projects that I'm working on. If you would like to contact me, please feel free to stay in touch! Sign up with your email address to receive updates and free resources! I respect your privacy and time. Newsletters are sent quarterly. Thank you for joining in! I hope this is the beginning of a beautiful friendship.